When relocating, moving heavy and large furniture pieces is challenging. Unless you ask your friends for help, it will turn into a mission impossible. When it comes to this moving task, it is recommended that you hire professionals to avoid any unwanted situations, damage and injuries. They have experience and knowledge in handling, disassembling, loading and transporting valuable furniture pieces. There are numerous advantages to hiring professional movers to move your furniture. Professional movers are trained and experienced individuals who will make sure to deliver your precious furniture pieces intact at your new address. Safety of your furniture is their primary goal. They will use high quality packing supplies and strategically pack each piece to ensure the safety. If disassembling is required, they will also take care of that. After packing, they will load and transport your furniture at your new home, and then unload and carry it inside. Remember, they use modern and useful moving equipment to ensure safety of your belongings. Moving and handling heavy and large furniture pieces without some kind of tools and equipment is extremely difficult, and perhaps impossible. Even with the help of your friends, you won’t be able to pack and load your furniture onto the moving truck without proper moving equipment. The risk of damaging your furniture and the property is high. Additionally, things can go wrong and you can end up with serious injuries. Therefore, you should leave this task to professionals who have all necessary moving equipment, including: moving dollies, a trolley, sliders, ramps, moving blankets, floor protections, straps, pads, etc. Additionally, furniture moving strategies and techniques are crucial when moving heavy furniture and that is a very valuable quality necessary for successful furniture moving. 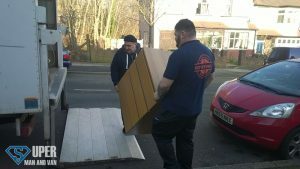 Professional movers know how to work with time and how to deliver a furniture moving task timely and professionally. They have years of experience in this field and they work fast not because they are in a hurry or want to get it over with, but because they have experience and knowledge when handling furniture. Their agility is invaluable and this is something you want when moving your valuable pieces of furniture. As we have established above, hiring professional movers when moving furniture is recommended and necessary to keep your furniture and your health intact. However, before you choose a mover, you first need to do your homework and research several companies until you find the right one that will fit your requirements and budget. One of the ways to determine whether a mover is reputable and reliable is by checking testimonials, ratings and reviews. Their previous clients’ opinion might help you to determine whether you want to hire them as well. Visit review sites and forums to gather necessary information. Additionally, ask your friends, neighbours and acquaintances for recommendations. And finally, after you have found couple of furniture movers that are trusted and professional, it is time to compare prices. Contact companies, ask any questions you may have and ask for a quote. If the final price is within your budget, you have found your furniture mover.